Monash University and The Chinese University of Hong Kong (CUHK) established a PhD exchange programme in 2017. 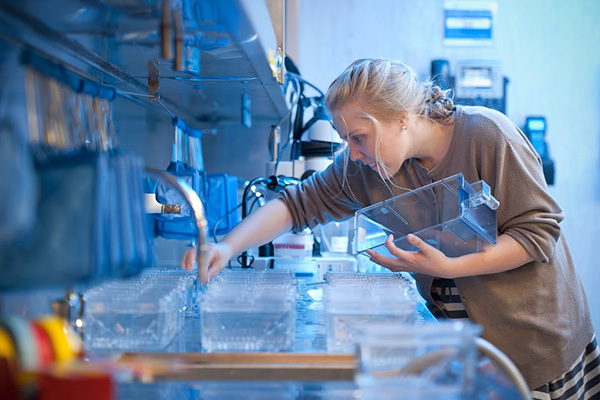 The programme aims to provide our PhD students with opportunities to access research expertise, resources and infrastructure at both institutions. 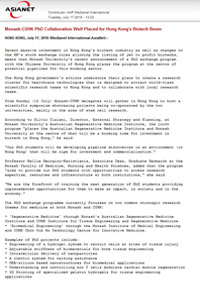 The programme will be administered by the Monash University Faculty of Medicine, Nursing and Health Sciences (FMNHS) and The CUHK Faculty of Medicine. The faculties share both common and complementary research strengths and capabilities and a strong focus on translational research outcomes. Build sustainable health research capacity by attracting high quality PhD’s, Post Docs and academic leaders into strategic research themes. Regenerative Medicine through Monash’s Australian Regenerative Medicine Institute and CUHK Institute for Tissue Engineering and Regenerative Medicine. Biomedical Engineering through the Monash Institute of Medical Engineering and CUHK Chow Yuk Ho Technology Centre for Innovative Medicine. Each project will be supervised by a Monash main supervisor and a CUHK co-supervisor. Please click here to view available projects and contact details at CUHK. Exceptional PhD candidates will be granted RTP Stipend (formerly Australian Postgraduate Award), 2017 rate A$26,682 p.a. for three years, with a possible 6 month extension. In addition, a travel allowance of $5,000 will be provided to contribute to costs associated with the candidates travel to and from CUHK. Phone: +61 3 9905 4313. "Biotech Boost aids postgrad research". Ginn Fung, South China Morning Post (Print Edition), July 13, 2018. 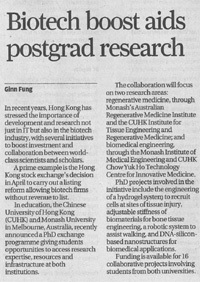 "PhD Collaboration Well Placed for Hong Kong's Biotech Boom". Medianet International-AsiaNet, HONG KONG, July 17, 2018.